China’s labor force is in decline. After fifty years of continued expansion, the labor force in China declined last year. Although China still has over 20% of the world’s labor, the decline is indicative of how China’s economy is transforming. Additionally, China is increasingly expanding its level of capital stock. Whereas in 2000 the U.S. capital stock per person was 12 times the level in China, by 2014 the ratio had fallen to 3 times. Recent investment by China has probably pushed the ratio even lower. China is quickly moving on par with the U.S. level of stock per person, even as China’s labor force declines. The government in China continues to promote the nation as one that mainly exports lower-value consumer goods and finished products. However, this does not reflect the reality of China’s investment in capital stock. The decline in China’s labor force will further erode the country’s ability to use labor to support its growth as a trading partner of lower-value consumer goods and finished products. The U.S. is currently a trading partner that exports higher-value capital goods and intermediary goods to China. The future for China’s economy will be in this same higher-value market of goods. Employers in China should expect to find it increasingly difficult to recruit and hire as China’s labor force continues to decline. Those with plans to expand into new markets should take this into account as they develop their hiring plans and corporate objectives. Employers should also expect the economy in China to increasingly expand into higher-value capital goods and intermediary goods. There may be significant opportunity in China for companies looking to expand in this market of goods. Relocation Management Companies (RMCs) are ideal sources for information on global candidate recruitment and relocation. Pre-Decision Services are critical for employers as they provide valuable information about a candidate’s ability to accept a position and be successful. Assessment data can be paired with structured interview questions to better understand the candidate’s interests, goals, and motivations. GMS’ team of corporate relocation experts has helped thousands of our clients develop relocation programs that attract and retain qualified employees. Our team can help your company by using industry best practices to design your relocation program for the greatest appeal to positions in China. This will increase your company’s ability to attract and retain new employees as China’s labor force declines and its economy transforms. 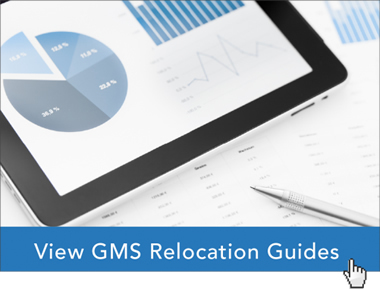 GMS was the first relocation company to register as a .com. It also created the first online interactive tools and calculators, and revolutionized the entire relocation industry. GMS continues to set the industry pace as the pioneer in innovation and technology solutions with its proprietary MyRelocation™ technology platform.